Bust-A-Move 2: Arcade Edition, known in Japan as Puzzle Bobble 2X (パズルボブル２Ｘ) is the sequel to the arcade version of Bust-A-Move. Like its prequel, Bust-A-Move 2 also started life out in the arcades, but was brought to home consoles including the Sega Saturn in 1996. Bust-A-Move 2 adds staples to the series such as the branching, tournament-style gameplay when playing against the computer. There is also a level editor. 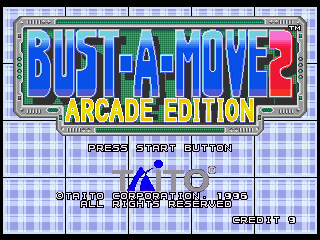 Despite its name, Bust-A-Move 2: Arcade Edition is an slight upgrade on the standard Bust-A-Move 2 released for other consoles. It includes an alternative set of levels as well as the original. The North American Saturn version of the game is notorious for having oddly designed box art, depicting severed heads in bubbles with sticks holding their eyes open. As such, it is freqently placed in top x worst covers lists. Similar complaints have been made for the later PlayStation 2 release of Super Bust-A-Move. The Japanese version of the game was later bundled with Space Invaders. Main article: Bust-A-Move 2: Arcade Edition/Magazine articles.